What a year for Cecil County! Last December, Cecil County embraced a new form of government, swore in its first County Executive and Council, and would go on to take pivotal steps in planning and creating its future. At CCPL, as educators, librarians, and leaders, we wanted to do our part to make this time of transition a success for our county and community. Board members and staff re-dedicated themselves to being resourceful community partners. We worked to build stronger partnerships with our fellow educators at CCPS and Cecil College to advance the commitment to educational excellence and STEM that would assure a much brighter future for Cecil County students of all ages. We proudly served on the leadership team for the Early Childhood Advisory Council with leaders from CCPS, Cecil College colleagues and Elkton Housing. We were proud to be asked to serve on the committee charged with drafting a county strategic plan for the future of Cecil County, to strategize on expanding economic development on the Economic Development Commission, and to help build new partnerships for fighting drug abuse. We worked together with our non-profit partners to do a better job of serving our homeless neighbors. We even broke some new ground by developing two videos to promote economic development in Cecil County (Libraries Changing the World and Beautiful Cecil CountyYour Business Belongs Here) and the librarys role in creating opportunity for our citizens. In the process of this work, we learned so much from so many of youdedicated community members, leaders, and county colleagues who may not always agree, but are so clearly committed to the same goalsa bright future filled with opportunity to live, work, play, and learn together. Many CCPL staff and Board members participated actively in the major community transition to charter government. As we end 2013, we plan to be part of a greater future, serving thousands of citizens with 21st century educational, business, and technological services, as well as learning opportunities. All of us at look forward to making year two of this transition even more successful! We all know the holiday season sometimes becomes the season for too much too much on the credit card, too much good food, too much shopping, too much to do, and too many places to go and people to see. Its fun and we love our frenetic traditions, but it can be overwhelming. I have the perfect antidote: too much TV! Take a break from the holiday hoopla or the January aftermath and binge on some great episodic TV on DVD, free from the library. Have you noticed that TV has gotten better lately? Modern TV series have dramatic plots and characters that resonate and draw the viewers into otherworldly experiences. The vast wasteland of old, mediocre TV has become a new frontier of intriguing, engaging, habit-forming and downright excellent programming. The kind of television that leaves you desperate to know WHAT HAPPENS NEXT? Why wait for one episode a week to dribble out? Watching multiple episodes of great TV on DVD back-to-back can be a very satisfying experience. Its just like reading a great I couldnt put it down novel and then gorging on the sequel. And there are some wonderful series youve maybe never heard of available now from the library on DVD. An epic story of love and betrayal, set during a formative period in British history, from the twilight years of the Edwardian era to the end of World War I. Based on the quartet of novels by Ford Madox Ford, this five-part miniseries was adapted for the screen by Tom Stoppard. 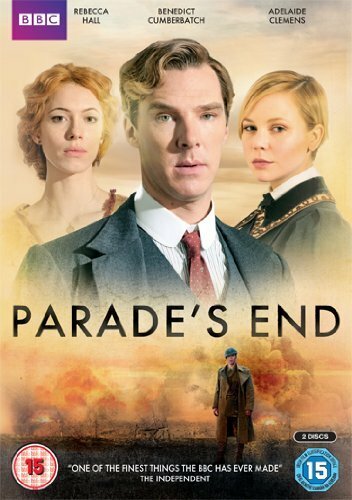 BBC delivers with beautiful costumes and settings and “Sherlock” fans will adore seeing Benedict Cumberbatch in a different role. Due to his old-school style, U.S. Marshal Raylan Givens is reassigned from Miami to his childhood home in a poor, rural coal-mining town in Eastern Kentucky. Lawman Givens is a tough, soft-spoken gentleman who never gives an inch. Based on a novella, Fire in the Hole, by Elmore Leonard. A Netflix original series now on DVD. Frank Underwood is a cunning career politician. Zoe Barnes is an ambitious young journalist. Together, they forge a partnership that trades powerful secrets for political access, and so much more. This story of inside-the-beltway political evil and intrigue will hook you. British series about four women who worked as code breakers at Bletchley Park and have taken up humdrum civilian lives after the war. They cant help but apply their code skills to their routine lives. Susan has collated data about a series of murders. She tries to convince the police she knows where another body is, but they are unable to locate it and dismiss her. She turns to her three code-breaker friends to work out where the next victim will be taken and find the killer. This HBO original series takes a behind-the-scenes look at a high-rated cable news program at the fictional ACN Network, highlighting the on and off camera lives of its acerbic anchor, a new executive producer, and their newsroom staff. Critics have loved it or hated it. When headline-making, life-ruining trouble rears its ugly head, there’s only one person to call: the legendary Olivia Pope. With her steadfast rule of always trusting her gut, Olivia leads an expert team of crisis management consultants skilled at making even the most sordid, salacious scandals disappear. But as these self-proclaimed “gladiators in suits” begin to reveal the cracks in their own armor, will the masters of damage control be able to control the damage in their own personal lives? In this British import set in London in 1956, the BBC has just launched “The Hour,” a topical news program. At the heart of the show are three contrasting journalists: enigmatic producer Bel Rowley, a spirited woman in a man’s world; her best friend, Freddie Lyon, a brilliant and passionate reporter; and charming, well-connected front man Hector Madden. As Freddie moves to cover a significant but controversial story, the trio becomes entangled in an intense interplay of politics, ambition and romance, all ignited by a mysterious murder and chilling conspiracy. A modern-day mockumentary that looks at the exciting world of local government. The series examines the mundane but necessary ways that people interact with their government, and asks why it’s frequently so complicated — standing in line at the DMV, applying for home construction permits, or trying to get the city to fix a pothole. Check out the librarian! The story of Stephen Wraysford, a young Englishman who arrives in Amiens in Northern France to stay with the Azaire family and falls desperately in love with Isabelle Azaire. They begin an illicit and all-consuming affair, but the relationship falters. Years later, Stephen finds himself serving on the Western Front in the very area where he experienced his great love. He must learn to endure the ravages of war and make peace with his feelings for Isabelle. Based on the popular novel by Sebastion Faulks.